We meet one of the pro-Catalan independence leaders in jail in Spain accused of rebellion. Kate Adie introduces stories form correspondents around the world. 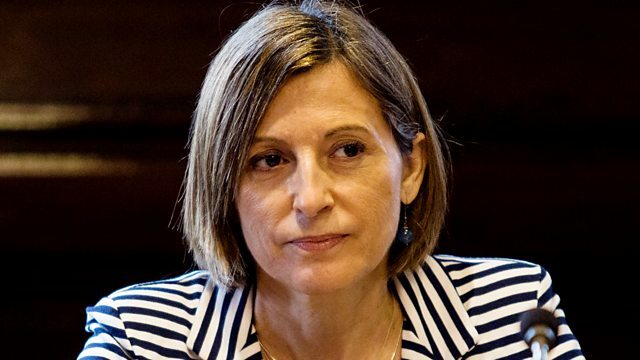 Before the contested referendum on independence Carme Forcadell was the speaker of the Catalan parliament, but since March she has been in a Spanish jail accused of rebellion. Niall O'Gallagher meets the ever defiant separatist politician. Sarah Rainsford is surprised at the warm welcome she receives in the frozen Siberian city of Irkutsk - where, unlike in Moscow, people seem willing to criticise their President and are happy to speak to a Western journalist. Alastair Leithead discovers the vast size of the Democratic Republic of the Congo - as well as its dense forests, potholes, bureaucracy and corruption – make it a difficult place to get around as well as to govern. Rayhan Demytrie finds that the inauguration of Georgia’s first female President may not mean much for gender equality in the country. And Lucy Ash discovers that DIY DNA testing kits that help your trace your ancestors are revealing far more than some Americans bargain for.